Find, with the six sections of our FAQs, a host of information on the Accès Condos program and its accredited projects. If your questions are not reflected in this page, thank you to use our contact form. Is the purchase credit applicable to any new construction project or the resale of the condos? The purchase credit is only applicable to projects accredited by the SHDM on the territory of the Ville de Montréal. Does the Accès Condos program enable the purchase of a property located outside Montréal? No. Accredited Accès Condos projects are exclusively within the territory of the Ville de Montréal. Are accredited Accès Condos projects planned for all the boroughs in the city? We want to offer projects in the largest possible number of boroughs, insofar as they contribute to the revitalization of neighborhoods and social mix. Between 2005 and 2015, Accès Condos has accredited 30 projects in 10 boroughs. No Montréal borough is excluded from the program, however, the development of affordable projects that receive Accès Condos accreditation depends on many factors including the availability and the price of land. How are accredited projects selected? Accredited projects are selected following a public call for proposals published on the Système électronique d’appel d’offres du gouvernement du Québec (SEAO) based on a set of performance criteria, including quality of the homes and their affordability and the potential of urban development related to the project. The Accès Condos program plays a dual social role. 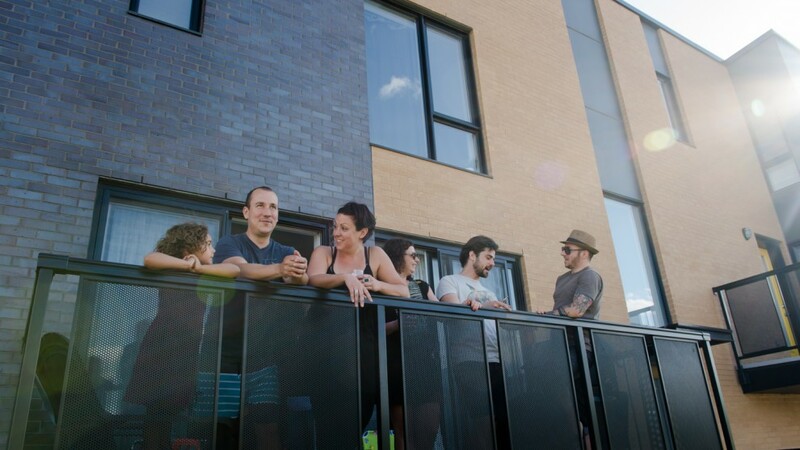 It provides access to quality properties for residents of Montréal and promotes the revitalization and growth of neighborhoods in which it supports real estate projects. Aside from condos, can houses be accredited by the Accès Condos program? Accès Condos applies to divided co-ownerships (condominiums) accredited by the program. These condos can have different architectural styles including houses on two or three levels (e.g. in the Faubourg Contrecoeur project and VIA3). To date, single-family detached homes have never been the object of Accès Condos accreditation. As a developer, how can I become a partner of an Accès Condos accredited project? The Accès Condos website is designed for buyers. For information on obtaining the Accès Condos accreditation for your development project, please visit the Société d’habitation et de développement de Montréal (SHDM)’s website. Click here to consult the page intended for housing developers. Can the purchase credit be used as a down payment for the acquisition of a property? It is precisely its purpose. The value of the purchase credit is recognized by financial institutions as a down payment for the acquisition of a property and enables buyers to negotiate a mortgage loan in optimum conditions. Can one contribute a higher amount than the mandatory deposit of $1,000? Of course. Accès Condos offers a purchase credit that covers a minimum down payment of 10% of the price of the condo, but buyers are quite free to add their own funds. This will enable them to reduce their mortgage. Is the $1,000 deposit paid to reserve my unit refundable if I change my mind? The $1,000 deposit is not refundable. We encourage you to think carefully and to have your mortgage approved or pre-approved before signing the purchase agreement and paying your deposit. Should I do business with the bank financing the project? Doing business with the financial institution recommended by the builder offers several advantages, especially as the value of the condo project was evaluated and recognized by that institution, which facilitates the application process for the buyers. This is however not an obligation and buyers are free to contract their mortgage with the institution of their choice. Are the prices of the units negotiable? The Accès Condos program sets up several measures to provide affordable units, decreasing the risks, delivery time and prices before marketing the project. The selling prices are therefore final and not negotiable. Can the Accès Condos program be combined with other subsidies? Yes. If you meet the eligibility criteria of homeownership financial assistance programs in force, you can get subsidies or targeted financial assistance offered by the Ville de Montréal and other organizations. However, you must apply directly with these institutions. Visit the habitermontreal.com website for more information. What is the duration of the financing agreement signed with the SHDM? The resale of your property. The end of the amortization period of the initial mortgage loan. An increase of your mortgage. The leasing of your property. If you are in one of these situations, we invite you to consult the section dedicated to the owners of an accredited Accès Condos unit on the SHDM website. What does the termination of my agreement with the SHDM entail? The termination of the agreement entails the repayment of the purchase credit granted when you bought your unit in addition to a percentage of your capital gain (corresponding to the percentage of the purchase credit). In addition, the sale price of your property must be approved by the SHDM. To understand how to proceed, see the section dedicated to the owners of an accredited Accès Condos unit on the SHDM website. Can I make changes to the plans or fittings before my unit is built? The plans of the units have been standardized in order to keep construction costs low. So you cannot make any changes to the plans or fittings of your unit before its delivery. Can I choose the finishing elements such as floors, cabinets, etc.? In order to keep construction costs as low as possible so as to offer affordably priced units, developers of accredited Accès Condos projects generally offer only two or three options. It is not possible to change these. No. In general, accredited Accès Condos projects include a number of indoor and outdoor parking spaces, according to density standards set by the municipality. However, they are sold separately. Are the areas shown on the plans net or gross? The areas shown on the plans are gross. That is to say they comprise half the thickness of the partition walls and the entire thickness of the exterior walls. The area of the balconies is not included. Is the transaction with the SHDM or the developer? From whom am I buying my condominium? The purchase transaction takes place between the buyer and the developer who supports the construction project and offers all the guarantees related to new constructions. The developer’s name is specified for each project in the sales office and on the website page for the project. Visit the projects section to find the developer’s name. What is the responsibility of the SHDM towards the buyer? With the Accès Condos accreditation, the SHDM offers the buyer a purchase credit of at least 10% of the price of the condo applicable to a down payment. This purchase credit is subject to a specific financing agreement, but that is separate from the sales contract. The SHDM therefore does not act as a developer, a builder or a seller. Who is responsible for after-sale services and the guarantee? The developer is solely responsible for the delivery and quality of the units in accordance with the provisions of the Quebec Civil Code In addition, a new home guarantee plan is offered by the developer to each purchaser accredited under the Accès Condos program. The SHDM is not responsible for the after-sale service or the application of the guarantee. For its part, the SHDM ensures that the developer has taken all the guarantee-related measures required as part of the Accès Condos accreditation before the project’s delivery. Who are the builders participating in the Accès Condos program? Accredited Accès Condos projects comply with a rigorous selection process through a public call for proposals to identify the most interesting projects and select developers meeting demanding criteria as regards experience and professionalism and the provision of the best guarantees in the industry. Each project is subject to a specific accreditation. This is why developers and builders vary from project to project. Are residential buildings protected by a new home guarantee plan? The SHDM requires from developers selected to build and sell Accès Condos accredited units, that a guarantee plan be offered to each of the buyers by a duly authorized administrator, including the Garantie de construction résidentielle (GCR), the Association des professionnels de la construction et de l’habitation du Québec (APCHQ), and the Association des constructeurs du Québec (ACQ). Because the projects each have a specific developer, you must consult the documentation of the project that interests you. For projects currently for sale, please visit the project page in our “Projects Underway” section. If you have already made a deposit and signed a promise to purchase or own your unit, you will find the address of the developer on the back page of the preliminary contract and on all official documents pertaining to the sale of your unit. Am I free to sell my property at any time? You are free to sell your property at any time, provided that, under the terms of the Accès Condos Agreement, the purchase credit and the share of the increase in value specified in your agreement are repaid to the SHDM when selling your home. Who should determine the resale price of my condo? The owner is responsible for establishing the resale price of the condo. However, it must be approved by the SHDM in order to calculate the amount of the refund of the Accès Condos purchase credit. It is therefore suggested to have the resale price approved upstream of the negotiations with potential buyers. To apply for a resale price approval, see the section dedicated to the owners of an accredited Accès Condos unit to know how to go about it. How is the increase in value calculated? When you terminate your Accès Condos agreement when you resell your unit, the increase in value corresponds to the difference between the purchase price you paid and the final resale price obtained. Can I re-qualify for the Accès Condos program after selling my first program-funded condo? Yes. Let’s recall that the conditions imposed are to reside in your condo and to not simultaneously benefit from two Accès Condos agreements. But it is quite possible to enter two successive agreements, subject to ending the first agreement and reimbursing the purchase credit of the first condo before signing the subsequent deed of sale. When reselling, can I transfer the purchase credit to the buyer? The purchase credit is not transferable. It must be repaid by the owner to whom it was granted by the SHDM. If I sell my condo at a price below my purchase price, will I benefit from a reduction of the reimbursement of the purchase credit? No. Note that the purchase credit that has been granted to you is repayable in full and that no deduction can be applied even if you sell your condo at a price below its acquisition cost. In cases where the resale price does not reflect the market value, the share of the capital gain to be reimbursed to the SHDM will be assessed on the basis of the market value by the Finance team of the SHDM according to different criteria, such as the analysis of recent comparable transactions, the municipal assessment and market developments in the area. When reselling a condo with parking, how is the value of the condo determined for the purpose of calculating of the share of the increase in value to be repaid to the SHDM? Reimbursement of the share of the increase in value is only applicable to the condo. Should I deduct broker fees from the sale price of my property for the purposes of calculating the increase in value? No, no deduction may apply to the official selling price confirmed by the notary. Can I include, in the price used in the calculation of the increase in value, certain additional expenses incurred when buying (e.g. air conditioner, notary fees)? Pursuant to the terms of your Accès Condos Agreement, the increase in value should be calculated on the basis of the purchase price of the condo only, taxes included as registered in the deed of sale. Can I reimburse the purchase credit even if I do not intend to sell my condo? The purchase credit can be repaid at any time, upon a request for a statement of account which includes an assessment of the increase in value calculated by the Finance team of the SHDM according to different criteria, such as the analysis of recent comparable transactions, the municipal assessment and market developments in the area. For more informations, see the section dedicated to the owners of an accredited Accès Condos on the SHDM website. How is the amount of the reimbursement of the purchase credit determined if I do not sell my property? The amount you will be required to repay to the SHDM includes the original purchase credit granted to you and a 10% share of the property’s increase in value (or another percentage according to your agreement) that will be determined by the SHDM based on the market value of your condominium at the time of the reimbursement. This market value is determined by the Finance team of the SHDM by using different criteria, such as the analysis of recent comparable transactions, the municipal assessment and market developments in the area. For more information, see the section dedicated to the owners of an accredited Accès Condos on the SHDM website. Can I reimburse the Accès Condos purchase credit in several installments? No, the reimbursement must be made in one payment. The SHDM does not offer credit terms. Does the reimbursement of the purchase credit require the intervention of a notary? Yes, the reimbursement of the purchase credit requires a deed for authenticating the reimbursement paid to the SHDM. In this case, the legal fees are borne by the person reimbursing, i.e. the owner of the accredited Accès Condos unit who benefited from the initial purchase credit. In cases where the reimbursement is to be paid at the time of the resale of the condo, the operation is integrated into all the deeds related to the transaction. What process is involved in the case of a refinancing, cession of rank, etc.? The owner must fill out a request for a cession of rank or a transfer between joint purchasers, which is available online on the SHDM website. If the refinancing does not comply with the terms of your Accès Condos agreement, the purchase credit must be reimbursed and this process is initiated by filling out a request for a statement of account. For how long is the statement of account provided by the SHDM valid? The assessment presented in the statement is valid for a period of six months from the date of issue. No interest will be calculated on the basis of this amount. For more informations, see the section dedicated to the owners of an accredited Accès Condos on the SHDM website.